At Sunset Blvd. Vintage with Teresa, Pervis (left) and store owner Filippo (right). Photo by Denton Taylor. Last month I had the opportunity to not only meet for the first time my photographer friend, Denton Taylor, and his wife and model, Teresa, I got to meet them at the Manhattan Vintage Show, which I had never attended before. That’s the kind of multitasking I love. Mary McFadden ensembles at the entrance. Mary was there herself, taking pictures! Photo by Denton Taylor. The vintage show was a real eye-opener for me. There are gorgeous designer pieces to be had there, in mint condition, at a fraction of the price than a new piece from the same designer. And a new piece of course wouldn’t have my favorite part, the history of the clothes. For instance, I found a Valentino ensemble I’m still thinking about, but did not buy, a black knit short-sleeved sweater with a mid-length pleated black skirt with vertical stripes of bronze sequins. I wish I had a photo to show you but the vendors request that you not take pictures and I refrained accordingly. I’d say the ensemble was from the mid to late 90s, in perfect shape, and very wearable today, either together as a dynamite evening look, or as separates. It was $550. If I walked into Bergdorf today and bought this lovely Valentino tweed bouclé and lace dress it would set me back $3,490, plus tax! Maybe this beauty will show up at a future show for a lot less? I know all you vintage-loving foxes already know this stuff but it was an education for me. I guess you could call it high-end thrifting, to which I say, Yes, please! A Fall 2013 tweed bouclé and lace dress from Valentino. Future vintage? As for Denton and Teresa, I was a little shy to meet them but they put me at ease instantly and they are really cool and fun. They were received with excitement at several of the vintage booths, by vendors who remembered them (and what they bought!) from the previous show. They are quite a team! 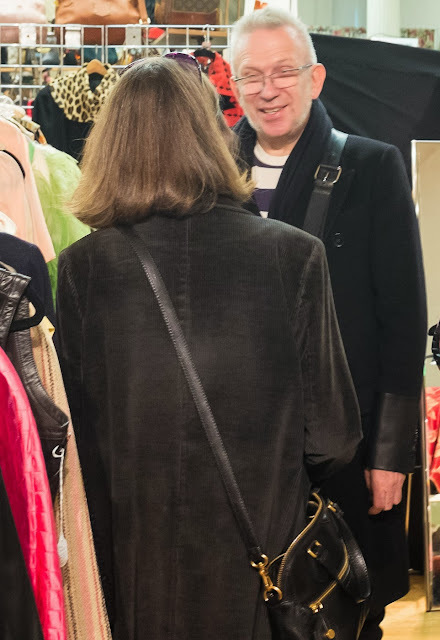 Denton was able to take a few photos, including this one of me talking to Jean Paul Gaultier, which I wrote about in a previous post. Talking to Jean Paul Gaultier. What a thrill! Photo by Denton Taylor. 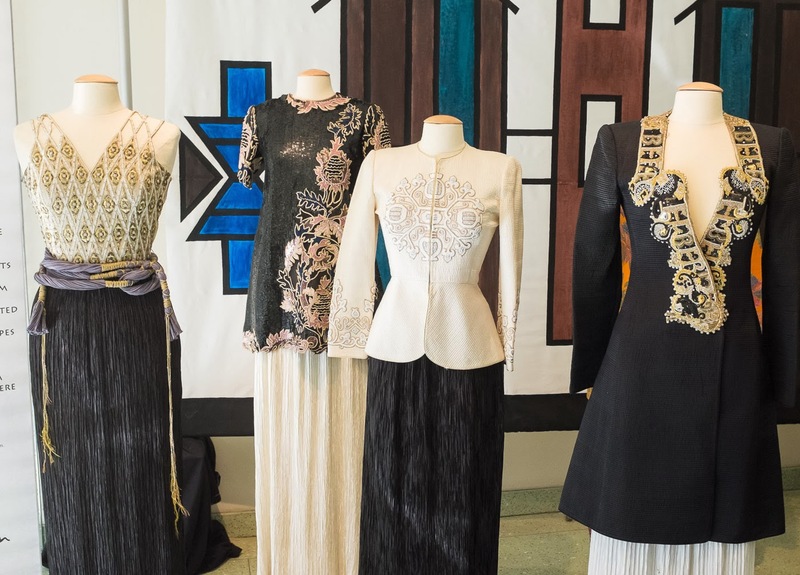 Have you been to the Manhattan Vintage Show? How do you feel about high-end vintage? Do you own any? Would consider buying some? I’d love to hear your opinions on or experiences with this topic! Jill, it was fabulous meeting you too, and so glad to walk around with you and your encyclopedic fashion knowledge! (Never would have known that the unassuming guy with the gray hair was Gaultier without you). I just love going here. After you go a few times, and meet many of the same dealers, you begin to get a sense of which dealers are in synch with your own tastes. The word 'curated' seems oft abused these days but it's like walking into a museum where stuff is curated just for you! The guys at Sunset Boulevard (I think they recently got married btw) are an example of that. I know what I like for my wife as does she, but he'll pull out all kinds of stuff you never would have considered and before you know it you're leaving with a bag of wonderful stuff! (Or as my wife says, to where I am going to wear all this?) Filippo is fabulous, he's very Italian and goes to Italy several times a year just to buy for the show. Most dealers are amenable to shaving the prices a bit, especially if you are a regular and/or are buying multiple pieces. Speaking of prices, either bring plenty of money or decide a strict budget in advance. Every time we go we always spend more than we had anticipated, but in the end we're happy since we get home with so many fabulous pieces, compared to what me might spend on a skirt in the window of Saks! I actually got rid of some high end stuff I no longer wore but in the end I got very little back and the consignment store did very well out of the fact I still haven't figured out eBay. But now I am keeping the stuff until I learn how. I think in certain cities like new York and London that there is such a thriving vintage and second hand market that there are no bargains at all to be had! Thank you Denton for such wonderful advice and tips on how to navigate this show! I have never been there, but would love the opportunity to go! I would also love to see the vintage ensemble you could not photograph. This sounds like such a lovely time, Jill. Glad you got to go and Denton's comments above are so kind. How fun! So glad you got to meet Denton and Teresa. Now about that Valentino number....are you going to go for it?? I have attended this show before and just did recently with this show. It is lots of fun, the fashion is amazing and some of the dealers are really wonderful people. Looks like you had a grand old time! It is great to go, even if just to look but there are affordable items as well as the high end which is cool. Oh Jill, you always find the most amazing places in NYC! The vintage show sounds like a must see, to be sure! I always enjoy your blog so ... although it does make me miss one of my favorite cities, terrible! I might need to put revisiting NYC on the top of my travel list! Thank you so much for sharing all of your adventures!